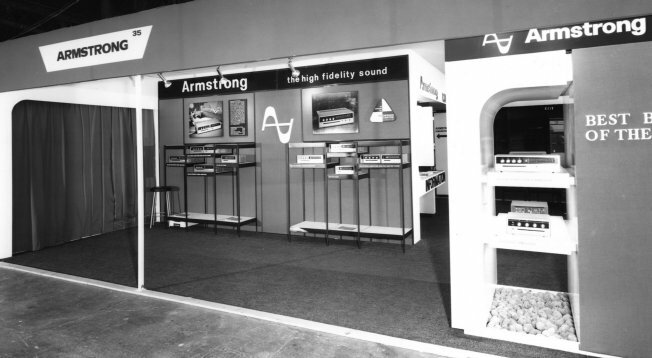 The above image is an external view of the Armstrong stand at the 1972 London Audio Show at Olympia. You can see the Design Council logo prominently displayed on the stand. The company were proud of the fact that many of their ranges were awarded Design Council labels in recognition of their good overall design. The 600 range was launched at the Sonex Show in 1973. As usual, the presentation was based upon an automated demonstration programme. The musical items used are listed in the image to the left which is taken from a leaflet handed out as part of the publicity and information pack available at the show. All of the items were recorded onto a Revox A77HS Dolby B recorder at 15ips, using 600 range equipment. The excerpts from LPs were recorded using a Shure V15II cartridge in an SME3009II arm and Thorens TD125II turntable. The radio item was recorded at home by one of the staff from their 626 receiver. The details of all the equipment used for recording were also specified in the leaflets handed out at the show. This information was provided to allow the audience to know that, despite the use of tape, the sound would be similar to that they could obtain using 600 range items with similar equipment in their own homes. In the 1960's Armstrong used a variety of employees and friends for the announcements on the demonstrations. By 1973, however, the company had begun to use Alan Dell, the well-known BBC Radio 2 Disc Jockey, to narrate the announcements in the programme. Alan was a fan of the 600 range equipment and actually used it to record his programs for the BBC. He found the overall performance excellent. In addition he found the unusual features of Armstrong equipment particularly useful. The amplifiers were designed so that the signals were passed through the tone control and filter sections before the results were fed to the tape outputs. This arrangement was quite unusual. Most other manufacturers simply provided tape outputs directly from the selected input. The disadvantage of having active stages before the tape output was the risk that these might adversely affect the signals before they could be recorded. The advantage was that it became possible to adjust the tonal balance of the signal from a source, and filter it if required, before recording the results on tape. For some professional users, like Alan Dell, this flexibility allowed them to adjust the recorded sound to achieve the results they desired, particularly when working with a variety of material from the technically excellent to the 'historic but poor'. Towards the end of the 1970's Armstrong ceased being regular attendees at Shows and Fairs as the business contracted and they became concerned with seeking a way to find a new factory, and the backing this would require. The last show they attended was the Audio 81 Show at the Swiss Cottage Holiday Inn, London, in February 1981. This show was the public launch for the new 700 range. For this show, the company simply hired one of the rooms at the hotel for displaying the new equipment and giving people an opportunity to hear it in action. The images above and below are photographs of the displays in the demonstration room, taken before the public were admitted. The demonstration consisted of playing selected LPs. By the 1980's it was felt to be desirable to move away from a tape-based automated demonstration. This was partly due to a concern amongst some show visitors that an extra ‘tape stage’ between the LPs and the equipment might degrade the sound, however slightly, thus impairing the sound quality. There were also, inevitably, some people who were suspicious of taped demonstrations as they worried that the results may have been ‘doctored’ in some way in order to achieve a sound which they could not replicate themselves at home. In addition, simply playing LPs was rather more flexible than tape. It permitted a few LPs brought to the show by visitors to be played. This was helpful to visitors who wanted to hear recordings they preferred and with which they might be very familiar. At times, however, this could have some interesting results. For example, during this show one visitor brought along a copy of Mango Crazy by Roger Chapman. (Who was previously in the group Family.) I was looking after the demonstration system at the time and was quite happy to play this as I quite like Roger Chapman. It rapidly became clear, though, that most attendees of the show were rather less keen on this music than myself or the person who brought the LP. The room emptied of other potential customers quite rapidly! I therefore had to apologise after a couple of tracks and switch back to a more popular choice of demonstration music. The LP system chosen for the show was a Linn Sondek/Asak/Ittok combination. A number of people entering the room were heard to say words to the effect that, “Look, they're using Linn as well!” as if this was some kind of badge of approval. In reality, the Armstrong team did not have a specially high regard for the Asak cartridge in particular. However it was in those days felt to be ‘high end’ and they decided to use it for two reasons. The first being the assessment that many potential purchasers of the 700 amplifiers would also be considering the Linn equipment as their main signal source. The second being that since other manufacturers were also using Linn items for their demonstrations it would permit a more ‘like for like’ comparison between the 700 units and other amplifiers at the show. 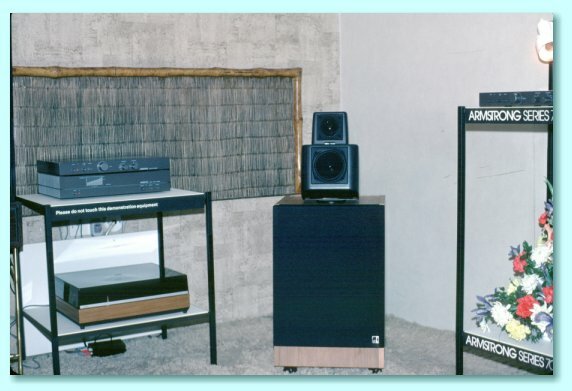 Thus it was felt to be fairer on the public attending the show to use the Linn equipment as it would give them a better chance to assess the comparative merits of the 700 range. Overall, the reactions created by the show were very positive. Most people were clearly very impressed with both the build quality of the 700 units, and by the very high standard of the audible performance. The new units featured prominently in the later issue (May 1981) of ‘Hi Fi News’ that reported on the show. Indeed, they also featured in that month's editorial! 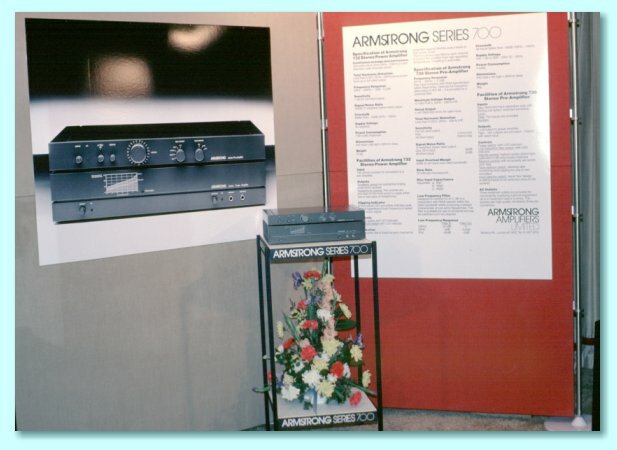 The only negative comments were ones uttered in regret by a few people who said that they admired the new amplifiers, but despite being long-term Armstrong fans, probably could not afford them. The estimated prices at that time were £295 for the pre-amp and £575 for the power-amp. By way of comparison, you could still find new 621 amplifiers at that time for around £120, and, and even a Sugden A28 integrated Class-A amplifier could be had for £178. The pricing of the 700 range was in line with the higher end of the market, and reflected its very high level of performance. In those terms it could be said to be priced competitively at the time. As an example it could be compared with the Lentek integrated amplifier, launched at the same show at a price of £695, despite have a far lower specification than the 700.